In this post you will see that I saved the best saver until last.Save the environment—and your wallet—with a few easy changes to your laundry routine Wash clothes in cold or warm water instead of hot. According to the California Energy Commission, 85-90% of the energy used by washing machines goes to heat the water. And washing in cold gets your clothes just as clean as hot. Tide Coldwater, the first detergent specially formulated for energy-saving, has the same stain-fighting power as the original. Pre-treat stains and presoak very soiled items so you don't have to put them through the washer twice. 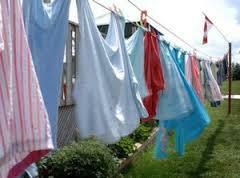 Hang dry laundry to reduce your electric dryer use. If weather prevents you from line-drying outside, buy a drying rack to use indoors. Or buy a tension rod and hang garments on plastic hangers in a doorway or alcove. Don't over-dry clothes—it wears your clothes out faster and uses more energy. Use the auto-dry feature if you have one, or set the timer for shorter intervals and check clothes to see if they're done. Pull clothes out of the dryer while still damp and hang them up. They will dry with fewer wrinkles, reducing the amount of ironing you normally do. Clean the lint filter in your dryer after every use—it improves air circulation so your dryer works more efficiently and quickly. This last peice of advice comes with aprice tag, but the benefits soon out weigh the price. This item will cut your laundry costs every time you turn your washer on, cause your fabrics to be fluffier, brighten and get out soils far eeasier than conventional means. In December we invested in a residential ozone injection unit for our washer. Joannie was very skeptical. By adding this small wall unit which puts ozone into the incoming water, we now wash with the hot water diconnected, and never add an ounce of laundry soap in a normal cycle, How much could you save every week with this laundry helper? Where can you get one of these units? There a few suppliers : Laundry Pure by Vollara and o3 Pure among others. What do they cost? $300 - $700. Are they worth it? No soap, no hot water, easier on the fabrics? oh yes. Just some thoughts because We care about the Fabrics of our homes and the Air we breathe.